Embracing change is one of the guiding principles that has helped us keep on course for our first 14 years in business. As the market continually evolves and changes, we’re happy to be able to explore the SMB marketing opportunities with some of our newest clients. From Oprah’s favorite photo frame to San Francisco’s only full marathon, meet some of the new small- to medium-sized businesses we’re working with, and learn the tactics we’re using to help them grow. A new client of ours, Aura, makes a gift that literally lights up the room. It’s an elegant frame with a simple app that lets you send photos from your phone to your frame instantly, without going thru social media. Its signature model has caught the eye of Oprah herself — having recently being named one of Oprah’s Favorite Things. Increasingly, online video has become one of the most effective SMB marketing tactics in the industry — which is why we’re helping Aura grow with a new video campaign. Just how powerful is video? By 2021, Cisco’s data analysts have predicted that video content will represent over 81% of all consumer Internet traffic (in 2017, it was already 69%). As this number steadily climbs and users grow accustomed to receiving their education and entertainment in video format, the choice to not do video puts SMBs at a clear disadvantage. That said, in recommending video for Aura, we weren’t only thinking of the potentialities of video in the future: There are plenty of reasons why video matters enormously for small to medium-sized business right now. For example, there’s the powerful fact that video on a landing page can increase conversions by 80% or more — or that having a video on a landing page makes it 53% more likely to show up on page 1 of a search engine results page. If a company’s current social media or display ad campaigns are clicking through to a landing page without video, it’s easy to see how conversion rates (and organic search traffic) might suffer. This year, we’re extremely excited to help The San Francisco Marathon fill the streets of San Francisco with nearly 30,000 distance runners. Now in its 41st year, The San Francisco Marathon powered by RUN365 is a world-class running event that brings passionate runners together in pursuit of a single goal. We’re inspired by the tenacity of this small business, and the community of runners it serves. 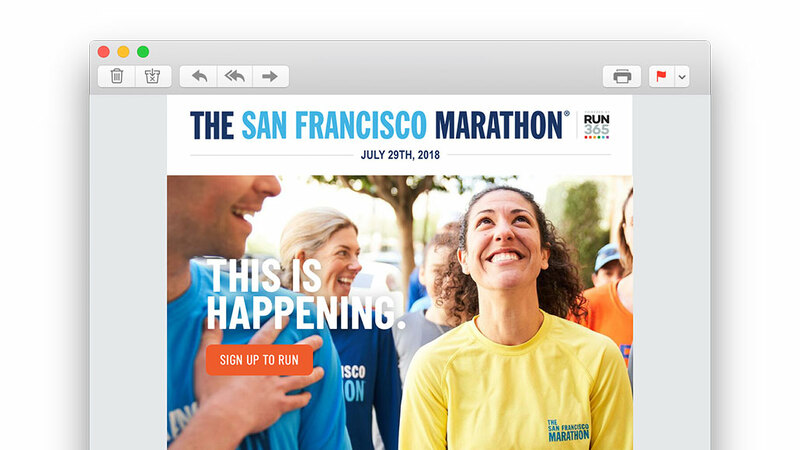 Beyond developing the San Francisco Marathon brand campaign, “This Is Happening”, one of the ways we’re helping them reach their audience of passionate runners is through email marketing. Why do small- to medium-sized businesses like The San Francisco Marathon find success with email campaigns? Well, there are a lot of reasons! First, according to MarketingSherpa, 91% of US adults like to receive promotional emails from companies they do business with. Not only that, the ROI is extremely high among SMB marketing tactics — and a lot of it has to do with visibility. 90% of email gets delivered to the intended recipient’s inbox, compared to only 2% of your Facebook fans seeing your posts in their News Feed! So it makes sense that email would have such a high ROI: $38 to every $1 spent to be exact. 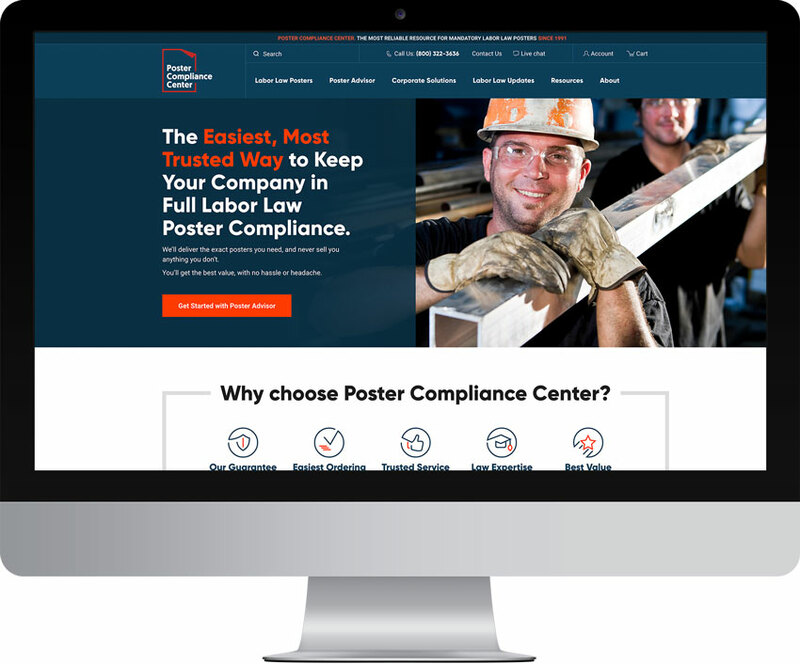 This year, we launched a brand new website for Poster Compliance Center, an SMB dedicated to helping companies across the United States stay compliant with rapidly changing labor law poster requirements. Their business model relies heavily on e-commerce, which is why their website needed to make it as easy as possible for customers to find and purchase the posters they needed to stay compliant. There’s no question e-commerce is growing for SMBs and larger organizations. In fact, e-commerce was up 17% year over year by Q3 2017, and mobile e-commerce had leaped an incredible 40% higher in the same time period. E-commerce is growing — and mobile e-commerce is growing even faster. For Poster Compliance, we wanted to create a website experience that met the modern user where they do business today (i.e., online). To make sure Poster Compliance could keep up with the pace of growing e-commerce, we optimized their catalog structure so customers could search for the labor law posters they needed, faster. We also updated the general website structure and navigation to prioritize their flagship OneSystem plan, and made the site responsive, with a mobile version so that customers could purchase their posters and plans via their mobile device just as easily as they could on their desktop computer. We also translated Poster Compliance Center’s legendary customer service into new digital channels like live chat, a more sophisticated Poster Advisor Quiz tool, and a more robust FAQ. Finally, we integrated Poster Compliance Center’s digital ecosystems so that their CRM and e-commerce tools could work together automatically, without time-consuming manual uploading and downloading of information. This saves time for Poster Compliance, and creates a more personalized and effortless user experience for their clients. What about social media? Great question! Social media is still very much an effective tactic for small businesses. In fact, almost 90% of marketers say their social marketing efforts have increased exposure for their business, and 75% say they’ve increased traffic. To make SMB marketing efforts on social media a bit easier, download our free social media cheat sheet! It’ll help you optimize your marketing assets for the most popular social media sites.